Fair Isle and Stripes - New Year's Eve Style. So, I am feeling a bit under the weather plus I got a lot of things to do at home a day before NY Eve so I will keep it short today. I ended up loving how this Red Fair Isle Sweater paired with the Striped B+W Skirt. Never paired these two prints, together, before. Adding some Red Peep-Toe Pumps and some small Bling Jewelry and I got a Festive Outfit in my hand. Perfect for New Year's Eve in fact, if you want to dress up but not be super fancy. What are you doing on NY Eve? Come back here on January 1st and join "What Wives Wear" Link-up with me and two other Wives. But we accept all fashionistas, wives or not. That's Vivian's little hand touching Mommy's Pretty Shoes. She loves shoes in general, especially mine. My husband says we are in trouble lol. Orange-Red, Pine Cone & Hearts Sweater: Koton (similar, best deal, love this), (similar by Kensie, great deal, love this), (short-sleeve option by Tommy Hilfiger, on sale). Black & White Ponte Mini-Skirt: Express (very similar midi-length option by WHBM, great deal, love this), (similar mini, best deal), (similar mini w/ pockets, love this). Vintage, Gold-tone, Orange Flower Drop Earrings: Vintage (similar by Topshop, best deal), (similar by Swarovski, great deal, love this), (similar by Betsey Johnson, best deal, love these), (fun option by Betsey Johnson, great deal, love these), (gorgeous cluster option, Splurge). Gold Chain Necklace w/ Silver & Gold Beads & a Coral Flower Pendant: Bijoux & Accessories (fun cluster option by Betsey Johnson, love this), (similar, fine jewelry option, love this). Burgundy, Metallic, Butterfly Cocktail Ring w/ tiny Silver Stones: c/o American Fashion & Jewelry (similar, colorful, great deal), (similar in faux gold, best deal, love this). Black, Thick, Opaque, Fleece-lined Tights: Random Street Vendor (New) (identical from Topshop, love these), (similar by Steve Madden, best deal), (gorgeous dotted option by The Limited, love these). Red Satin, Peep-toe Pumps w/ Gold Chain Decoration on the front: Micci's (similar, gorgeous option w/ crystal bow by Betsey Johnson, love these), (sling-back option w/ bow + low heels, love these), (classic patent leather option by Ivanka Trump, best deal, love these), (fun option by Jessica Simpson, best deal). And here is a flash-back photo from almost a year ago, when I wore this same Striped Skirt with another Festive Sweater in January of this year. P.S. Linking up with Alison, Angela, Amber, J., Laura, Lauren, Lindsey, Rachel, Sarah and Shanna. Dressing the Bump: New Year's Eve Style. Since becoming a mom in January 2013, my life and style have changed a lot. At the same time my blog has become more than a Style Blog. My daughter makes a lot of appearances and I guess you could say we do a lot of "Mommy and Me" style posts together. 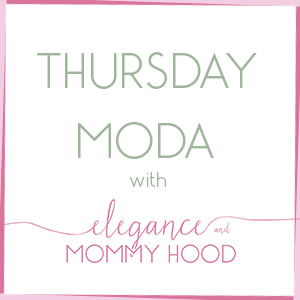 That is why I also changed the name of the blog to "Elegance and Mommyhood" because mommyhood is a huge part of my life. At the same time, I also am attracted to more and more Mommy Bloggers who just like me like to stay put-together and chic as much as they can, while taking care of their kids and their homes and being a wife at the same time. Trust me it isn't easy doing it all. I also enjoy seeing how some of my favorite bloggers I follow, approach pregnancy for the first time and see how they dress their bumps, for all the different events in their lives. I also love to do special posts involving other moms and giving them Guest Honors in my blog. Even more so for a Holiday or a Special Occasion, Back in May in honor of Mother's Day I did a similar post featuring two of my Most Favorite Fashionistas. Today I asked three of my favorite bloggers - all of whom I only discovered this year - to share what they would wear for New Year's Eve. What they have in common is that they are all Mothers-to-be: Katie and Lindsay for the first time while Brooke for the second time. I asked all of these ladies the same questions in order for you to get to know them a little bit and see how they styled their bumps for New Year's Eve so read below and get a better glimpse at each outfit, as well. Here are the four questions they all answered. 1. When are you due, boy or girl? 2. How has your style changed since becoming pregnant? 3. What is something a woman must wear or have on during New Year's Eve and why? 4. What are you looking forward to this NY Eve? Doing anything special? BROOKE from Pumps and Pushups. A1. I am due on March 16th with our second baby boy! A2. Everything is stretchier! When I'm not pregnant you can find me in a lot of pencil skirts and pumps, but with baby on board, I'm more likely to opt for flats and some leggings. A3. Just a little bit of sparkle! You must bring in the new year with a little glam, even if you're not dressing to the nines, which is the case for me this year, you can add a little sparkle in your accessories and be New Year ready. A4. Our NY Eve is going to be pretty low key but full of lots of friends and family. Two of our friends are throwing parties so we are going to split our night between the two. I'm really excited our celebration is casual this year so I can get away with being warm and comfortable! I am planning to add just a little bit of glam in my accessories and probably bold lipstick, but other than that, with staying up past midnight, I need comfort! KATIE from See What Katie Wears. A1. We are expecting a boy in April 2015! A2. In the beginning, my style didn't change very much, except that I stayed away from the cropped top trend and anything too tight. It's starting to get a little bit more challenging getting dressed now that my bump is getting bigger. I am tending to veer towards more casual looks lately - pretty much living in in my maternity jeans and layers. Comfort is key! A3. Something that makes you feel good! It's the last night of the year and it's a night to celebrate the past year and welcome the new one. I'm usually in heels and something sparkly whether we are going out or staying in! A4. I'm looking forward to a quiet New Year's Eve this year. I'll have a nice dinner with my husband and then we'll visit with some friends and family. It's my favorite way to ring in the new year! LINDSAY from Middle of Somewhere. A1. I am due May 21, 2015 and we just found out on the 19th that we will be having a baby GIRL! I couldn't be more excited! A2. My style actually has not really changed at all yet, except for the addition of maternity jeans/pants. My style is pretty casual to begin with, and I am having a lot of fun dressing my bump. I am still trying to wear most of my same tops and sweaters, which has worked out so far! They are a bit tighter now than they were pre-pregnancy, but I do like how they show off my bump more! I am slowly adding more and more maternity items, and am hoping that Santa brought me a few for Christmas. A3. I am always a fan of three main things for New Years Eve - a sparkly manicure, a bold lipstick shade, and a piece of statement jewelry! You can really dress up any outfit with these two additions. Last year I wore a pair of black pants, black heels, and a cream/black top, which is generally a pretty basic outfit. By adding a fun DIY manicure, a red lip, and a stack of gold bracelets, I feel like I was able to dress up my outfit just enough for the occasion. These additions are also perfect for more dressed up attire, as well as a super casual night in with jeans and a sweater. A4. This year will actually be the first year in awhile that my husband and I plan to stay in. We usually love dressing up and going out with our friends for New Year's Eve, but this year feels so different to me. Considering that this will be our last NYE without a baby, I am looking forward to some quiet time, as well as cozy slippers and PJ pants if I am being totally honest. I hope that whatever you do, you have a safe and happy New Year's! As you can see from their answers their styles are quite different however they all look stylish and put-together for one of the most special nights of the year. Brooke's Outfit is a typical Winter uniform of sorts for me, especially while I was pregnant and since I love wedge oxford booties I approve of it 100%. Lindsay couldn't go wrong in head to toe black which is always elegant, classy and in style. Love the sparkly silver sleeves and I love her idea of a fun manicure for the evening. Last but not least I love Dresses+Skirts plus Red is my favorite color so Katie's Outfit is something I would most likely wear on New Year's Eve. I also noticed they all choose pretty purses to accessorize with. 3 Beautiful Mommies-to-be for a casual, laid-back New Year's Eve. I wanted to end this Special Baby Bump New Year's Eve Post with a flash-back picture by yours truly. This is how I dressed my bump on NY Eve 2012. I had just reached 36 weeks a couple of days before, so I was full-term. Vivian was born less than 3 weeks later. Though we had a family dinner at home with my in-laws I still wanted to welcome the New Year feeling pretty so I wore a Silver Polka Dot Dress with this Teal Cardigan that has Silver Zipper-teeth detail on the shoulders. I accessorized with a Silver Necklace+Earrings set (worn most recently just in yesterday's post, actually). I did wear Ballet Flats (not pictured), too. This outfit never made it to the blog before now. Happy Monday Everyone - the last of 2014 and the start of a week that ends in 2015! Thanks for stopping by today and check out the blogs of my 3 Guests Featured. Shimmer Champagne and drops of Silver. A Festive Sweater doesn't have to be something covered in sequins, metallic or bows. It doesn't have to be fair isle either. Neither does it have to be all bejeweled. A Pretty Holiday Sweater can have just a little bit of sparkle, beading or fun detail to be special. Today I am wearing such a Sweater. I love the Champagne color of this Sweater and even more so the glam, silver mirror detail on the shoulders. It would be the perfect sweater to wear for New Year's Eve if you don't want to be too fancy in a dress or aren't going anywhere too fancy. As a matter of fact last year for NY Eve I wore a very similar version of this Sweater in Navy here. Today I paired my Sweater with my Rose Gold Pants whose Champagne Color matches the Sweater perfectly creating a monochromatic look. I added some Fun Silver Beaded/Leaf Jewelry which matches the silver shoulders, perfectly. As a matter of fact I wore this same set of Necklace+Earrings with my New Year's Eve Outfit in 2012 when I was 9 months pregnant. I ended up liking this Outfit a lot, what about you? I also found some adorable festive sweaters that I linked below. What are you wearing this New Year's Eve? I plan on wearing another festive sweater this NY Eve and keeping things simple, since we are staying in. Champagne/Ivory Textured, Shimmery Sweater w/ Silk Mirror Beading detail on the Shoulders: Koton (New) (gorgeous ivory option w/ lace detail, Splurge), (gorgeous neutral color-blocked option, best deal, love this), (silver embellished option, great deal, love this), (black w/ silver embellishment on the sleeves, on sale, love this). Ivory/Blush, Rose-Print, Skinny, Ankle-length, Jacquard Pants: c/o Zara (similar, gorgeous option w/ hot pink flowers, best deal, love these), (similar floral jacquard), (similar in blue+pink floral, on sale, love these), (similar w/ red pink, gorgeous option, great deal, love these). Leaf + Sparkly Silver Beaded, 3-Strand Necklace: White House Black Market (similar, best deal, love this), (multi metallic option, love this), (gorgeous, dainty sterling silver option). Leaf, Silver Dangly Earrings w/ Sparkly Silver Stones: White House Black Market (similar, best deal, love these), (similar, great deal), (similar, love these). P.S. Linking up with Andrea, Carylee and Gina, Carrie, Erin, Jen, Laura, Lauren, Mix it Monday, Nicole, Rachel, Rachelle, Patti, Rhea and Trend Spin. Happy Last Sunday of 2014!!! Ghosts of Christmas Past - Part Two. Christmas has come and gone however we are still in the spirit of the Holidays, right? How was your Christmas? What did you receive? For one, I am wearing my Red Coat again today (IRL) and have more red in my outfit too. A couple of weeks ago I showed you some outfits from previous, recent Christmas seasons. While I don't have the photos ready of what I wore yesterday (for this year's Christmas), I am showing you part two of Ghosts of Christmas Past. Ohh and a very cropped bob hair-style (back from 2007). This was a few days prior to Christmas when we took some photos as a couple (and of course a few by myself) and the couple pictures were for our Christmas cards that year. We put up the White Fake Tree that year. We owned both a Green and a White one (both fake, since we were living in an apartment). I decorated the tree in many colors and I love how it came out, especially the addition of several shoe ornaments which I purchased at the Shoe Museum in Toronto, the Fall of that year. My Outfit's Christmas Element: Red Stilettos with Bows, Silver Dangly Earrings and Silver Bracelet. A few nights after Christmas, spending a gift-giving dinner with some girlfriends. My Outfit's Christmas Element: Metallic Pumps, Chandelier Earrings, Christmas Nails and Red Lipstick. Christmas Eve at my parents' home where we had dinner that evening and shared gifts. My Outfit's Christmas Element: Coated, Metallic Greenish Blue Jeans and Green Sweater with embellishment around the neckline. 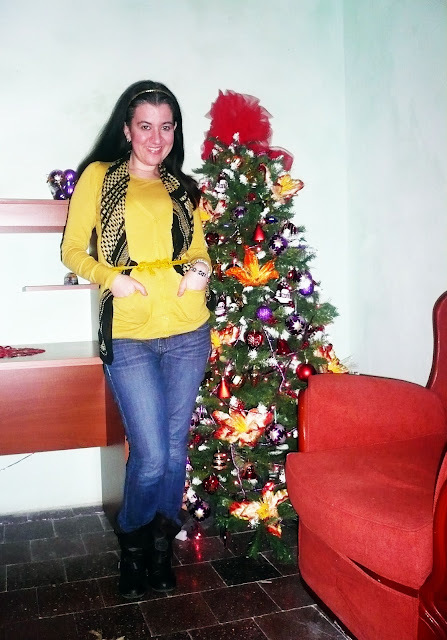 This was the First Christmas we spent at our first apartment together in Tirana - Albania (it was also the last Christmas at that apartment as we were looking for something bigger and more of a loft style, which we have now). Our first tree at a new place and it's a new tree with all new ornaments also. I took these photos after I was done decorating our apartment that day, sometime in early December 2011. My Outfit's Christmas Element: Gold Jewelry and Gold Braided Headband. But this Outfit is definitely more of a regular one, not necessary a Holiday Outfit. On Christmas Day after we got dressed to go for Dinner at my In-Laws. My first time spending Christmas day with them after I moved back to Europe (since my husband and I lived in the States). My Outfit's Christmas Element: Red (and Black) Dress with Bow, Red+Crystal Drop Earrings, Red Feather in my hair and Silver Bracelets. Starting off this year with one of my favorite photos. I wore this outfit also to the little photo-shoot we had for Vivian since it was her First Christmas. We had the shoot elsewhere but then I had my husband snap some photos of us by our home (next to our tree). My Outfit's Christmas Element: Red Silk Blouse with Bow and Red Ballet Flats. A few days before Christmas. I wore this out and about and to meet up two girlfriends for a gift exchange evening. My Outfit's Christmas Element: Velvet Leggings, Sequined Festive Sweater and Silver Jewelry. I wore this Outfit to a Christmas Fundraiser Luncheon where we were invited to bring the kids. I actually also wore a different Red Sweater and a different Faux Leather, Black Skater Skirt on the actual Christmas day that year but I don't have pictures from that day on this lap-top, sorry. My Outfit's Christmas Element: Red Sweater with Sequins, Heels and Silver Crystal Jewelry. P.S. Linking with Doranda, Erin, Jolynne, Lauren, Megan, Molly and Yalanda. Come back here on Monday for a Very Special Holiday Post. Happy TGIF and Enjoy the last weekend of 2014! Watcha Wearing Wednesday Christmas Eve Edition - Link Up and Christmas Tree. Since it is Christmas Eve I figured I should show you our little Christmas decor from our home this year. Vivian is almost 2 this year and she is at that stage where she is curious about everything and wants to touch everything. So, gone is our 6 feet tall tree. We were worried she would pull it and tip it over and hurt herself. Instead, I purchased a small (about 2.5 feet tall) tree for her and decorated it and wanted the tree to be far away from her to reach. So, I put it over the entertainment center with the rest of some Christmas decorations. I also put a couple more touches of Christmas elsewhere, like my pine cones and my Christmas Card display on the wall. Very simple and very little this year, especially for me since I love decorating for Christmas. I will let the pictures do the talking below. And in case you were wondering here is how I decorated for Christmas in 2013, 2012 and more as well as 2011. We also took some photos of the two of us just a couple of days ago. We wore cozy warm outfits since it has been quite cold here lately. Vivian is showing some Christmas spirit in her Fair Isle Cardigan and Red Sweatpants. I wore a Turtleneck Tunic Sweater with some Black Velvet Leggings. I also accessorized with a long, sparkly, silver crystal necklace and some crystal bracelets. Velvet screams Holidays to me. It is definitely a luscious, festive Holiday fabric, don't you think? What are you wearing this Christmas and what are your plans for today and tomorrow? Before you link up today - make sure you follow your host Victoria (on Bloglovin) and myself your co-host today (on Bloglovin). Thank you so much for linking up with us on such a Wonderful Holiday and Merry Christmas!! P.S. Also linking up with Alison, Brooke, Leeanne, Lisa, Liz, Morgan, Rebecca, Robyn, Sarah and Tameka.